Clothes that are exposed to too much heat and motion simply will not last. Our ProSense® Technology tumble dryers fine-tune cycles to ensure that they take the minimum time necessary with no over-drying. So your everyday pieces are dried efficiently, monitored constantly and cared for, cycle after cycle. Our dryers feature ProSense technology, which uses advanced humidity and temperature sensors to adjust the drying time and energy consumption for every size of load - whether it’s a day’s or a week’s worth of washing. This saves time and energy, while gently protecting the clothes that you love and wear every day. 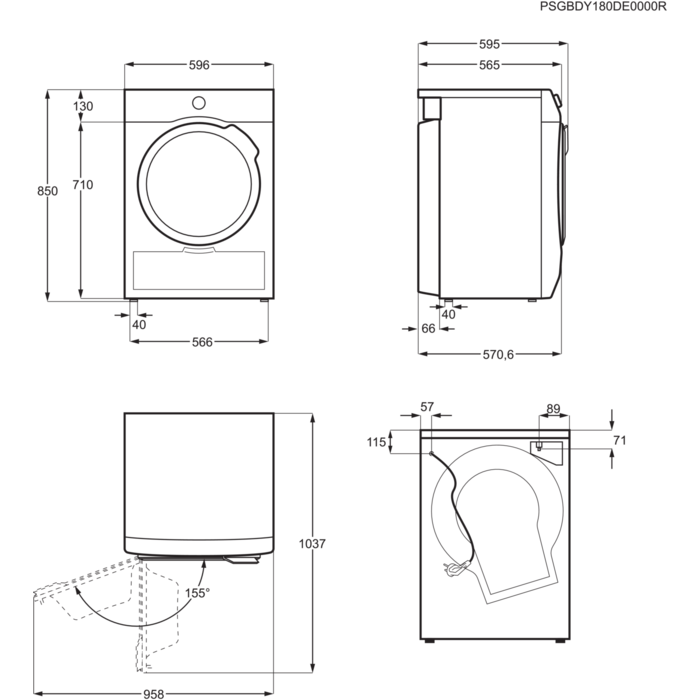 All AEG dryers have our ProTex gentle drum, specially designed to take care of your clothes. With this patterned drum, your clothes benefit from the most efficient airflow and have room to stretch out for less tangling and creasing. This tumble dryer comes with a fully reversible door. The option of placing the handle in four different positions means you'll have complete accessibility, however you choose to arrange your appliance with its washing machine counterpart. Our dryers rotate in a way that protects your clothes. The special ProTex gentle drum has a reverse action so it can move in both directions, stopping garments twisting and tangling together. As a result, you clothes come out evenly dried and with fewer creases. Delay Start gives you the freedom to do your tumble drying at the time you prefer. The Delay Start function allows you to automatically set the start time of your drying cycle. Repeated washing and drying can damage fibres in the clothes that you love. Our 6000 Series tumble dryers feature ProSense® Technology, which uses advanced humidity and temperature sensors to customise the drying time and energy consumption for every load. Ensuring your favourite outfits are never over-dried and retain their look and feel cycle after cycle. UK_TD_Drying technology_Condenser: The condenser dryer condenses moisture back into water and fills a large self-sealed water container that can be poured down the sink. This dryer can be situated anywhere in the home. Uk_TD_DELAY START: Delay start option ensures your laundry is ready exactly when required and helps to reduce creasing and musty odours. UK_TD_SENSOR_DRYER: Sensor drying gives you exceptional drying results and total control. Simply choose the required level of dryness on the rotary control, from 'iron dry' for slightly damp clothes to 'extra dry' for ready-to-wear results. The machine will then sense when the clothes are dried to the level specified. UK_TD_DELICATE_PROG: The delicate programme is designed for mixed fabrics found in delicate clothes. I purchased this dryer based on AEG's reputation for supplying quality products and i have not been disappointed. Before buying I read a few reviews that complained about laundry not drying correctly but i can only presume the users have not explored the full range of options this machine offers. You can tailor the drying time and programs to suit your particular preferences and i would give it 10/10 for looks and practicality.